'WALKING LOGIC', Christian Jankowski's latest exhibition at Galéria HIT in Bratislava until 21 November 2017, considers the cultural significance of walking sticks. While visiting Bratislava, Christian Jankowski happened upon a folk art shop and became intrigued with hand-carved walking sticks. These objects have been used as a support, a weapon and symbol for the wanderer for thousands of years. They are also among the first tools fashioned and decorated by men, anchoring them within the early history of art. In order to better understand the craft and history behind this form of folk art, Jankowski met with the 77-year-old woodcarver, Oldrich Richter, who made these traditional walking sticks. In a filmed interview, the two discuss Richter’s profession and his creative processes. The film, titled Carving Wood, becomes the introduction to the exhibition held at Galéria HIT, an artist-run space situated in the basement of the Bratislava Art Academy. 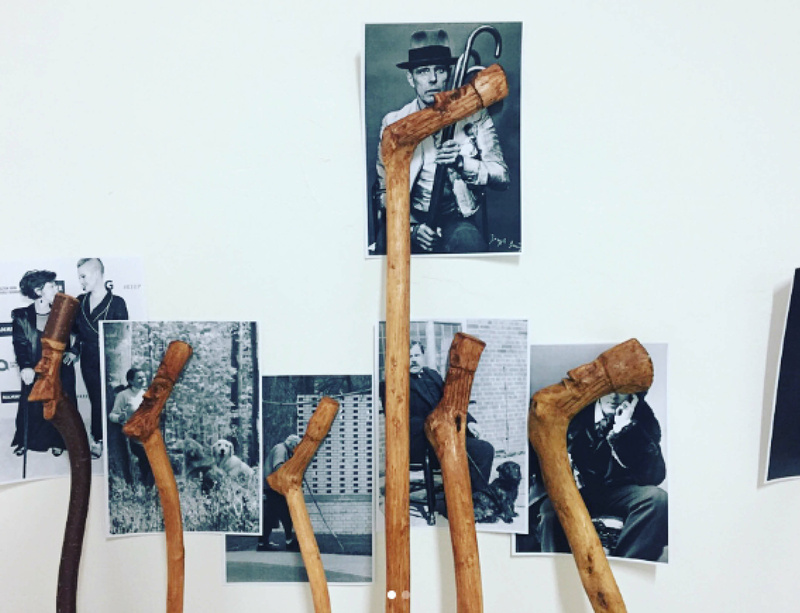 The artist commissioned Mr. Richter to produce a new series of walking sticks, exhibited as part of the installation History of Man and Stick. Jankowski leans these walking sticks against the gallery walls and uses them to hold in place images illustrating the use of such sticks through the ages: from ancient Egyptian wooden figures to Pope John Paul II to Leonardo DiCaprio. A surprising dialogue arises from the juxtaposition of the carved wooden faces and the illustrated faces.